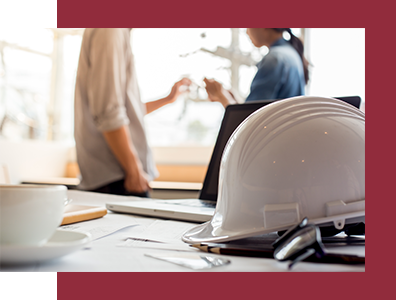 In 1995, Derrick Jernigan founded Horizon Builders with the goal of creating a construction firm that could offer a different client experience within the commercial construction industry. Having spent many years working for large companies, Derrick’s vision was to provide the perfect combination of professional and personal service. Joined in 1997 by Vice President and Safety Director James R. Ewing, Horizon Builders has successfully forged a connection with its clients through a formula that includes top-notch construction practices, strict attention to schedule and budget, the highest levels of safety and a personal touch. With more than 60 years combined experience across the leadership team, Horizon Builders takes pride in treating each client’s project as if it were their own. The scope of our construction capabilities ranges from tenant improvements, renovations and expansions, as well as turnkey design/build projects. We place the highest priority on the safety of our employees, subcontractors and the construction site. Through a comprehensive safety plan developed to account for all relevant OSHA regulations and environmental factors, our Safety Director and Project Managers maintain a strict safety protocol to keep our employees, our contractors and our environment out of harm’s way. Derrick Jernigan serves as President of Horizon Builders, the company he founded in 1995. Derrick brings more than 30 years of construction industry experience to his role. Prior to founding Horizon Builders, Derrick held several progressively more responsible roles with Centex Construction Company. As a project manager, he managed more than $170 million in various construction projects. Derrick holds a Bachelor of Science degree in Construction Science from Texas A&M University. Married and father to a daughter and two sons, he enjoys hunting, fishing, outdoor activities and spending time with his family. James (Jimmy) Ewing has served as Vice President and Safety Director for Horizon Builders since 1997, and has more than 30 years of industry experience. Prior to joining Horizon Builders, Jimmy worked for Ewing Construction, the family business where he began his construction career. As Ewing’s safety director, Jimmy managed jobsite and safety inspections, as well as safety program administration. Jimmy studied at Southwest Texas State University and Delmar College. He has two sons and enjoys hunting, fishing and outdoor activities.